If a marketer from Mars landed on Earth today, read through the last few years of search engine marketing trends, and was asked to come to a conclusion about the largest drivers of inbound traffic to websites based on the frequency of coverage, his/her answer would probably contain the words ‘content’, ‘content marketing’, ‘compelling content, ’social signals’ and ‘user engagement’. S/he would quickly surmise that the proven core tactics of search engine optimization (SEO) such as link building and contextual links (that had previously driven the lion’s share of organic rankings and hence web traffic) had been fundamentally altered. More importantly, s/he would also realize that Google had raised the bar within the SEO profession from a discipline mostly concerned with short term tactics and transactional issues to a more information-centric business model which now required a comprehensive SEO strategy based on customer acquisition, topical relevance and content development. The consequence is that going after the organic search opportunity these days is not an easy challenge and is likely the reason why a majority of small businesses are barely reaching their online potential. Unlike other channels such as paid search, SEO requires a more long-term approach to marketing where businesses must now make a concerted effort in content development – something that becomes increasingly difficult the smaller you are, especially in narrowly-defined market niches. This is exactly why VONT developed KFCPs (keyword-focused content pages), to make this easier and more tangible – but it is still no doubt more difficult (and harder to sell) than the easier but now greatly diminished SEO tactical approach of, say, contextual link building of a year ago. For many small businesses these days, there appears to be a fundamental dichotomy between SEO tactics and client expectations that revolve around the notion of content marketing and its inherent value in terms of potential return-on-investment (ROI). Because of Google’s recent search algorithm changes, SEO not only involves a lot of work upfront but a consistent (and some argue costly) investment in content development over time in exchange for an anticipated potential ROI in the future. More importantly, this issue forms the basis for any SEO work and the kinds of tactics required in order to perform and rank a business website given the implications for SEO in light of Google’s recent algorithmic search changes (Panda, Penguin, etc.). Plug into this the uncertainty of achieving known organic rankings and you can see why businesses are hesitant to make this kind of marketing commitment long term. Is organic search and SEO worth the investment? The question invariably becomes – is organic search and SEO really worth this kind of marketing investment for small businesses? Let’s examine this question from two possible perspectives: (1) from a purely numbers approach, and (2) from a common business investment analogy. First, let’s take a brief look at some of the numbers that support the business case for SEO. It should come as no surprise to web marketers that Google organic search is the largest driver of online traffic. However, being the biggest driver of traffic is not enough for us to draw conclusions about its value relative to other channels as a driver of leads – marketers also want conversions. A HubSpot study from earlier this year shows the highest percentage of leads end up as customers from SEO – a higher conversion percentage than any other marketing channel. 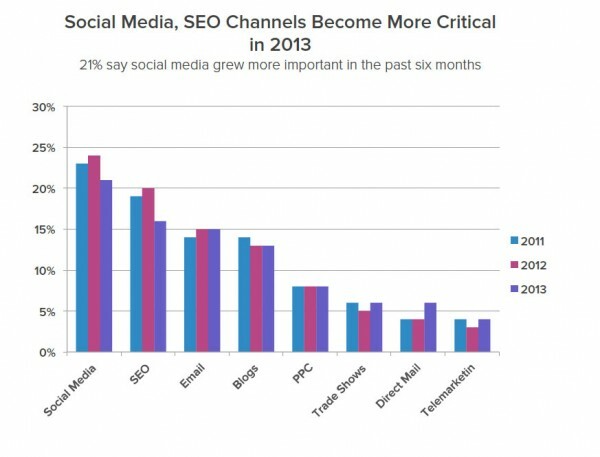 When we dive deeper into the HubSpot study and look at trends of how marketers view their marketing channels, both SEO and social media are seen as more important in terms of sources for leads then email, blogs, PPC, trade shows, direct mail or telemarketing. Organic search may not be the web traffic channel that gets the most media coverage, but the latest data with a statistically important sample size tells us it remains, by far, the largest driver of inbound web traffic. More importantly, organic search is also the best channel for converting customers – it has the best customer lead conversion percentage of all inbound channels. That should make organic search an incredibly important component of any small business’ online marketing plan. But what about the apparent gap between SEO tactics and client expectations that revolve around the notion of content marketing and its inherent value in terms of ROI? To better understand this SEO business concern and why it makes sense for a small business to make this kind of commitment, we only need to look to the field of investment management to find a compelling analogy. In this way, it is helpful to think of SEO and content marketing as a lot like wealth building: it is the equivalent of very patient money. With investment wealth management, if you are young and invest your first dollars into your company’s 401K plan, then you will not become wealthy overnight. It takes some time to build your wealth (your portfolio) and if you invest regularly, you will earn more than people who invest only once. If you invest too little, you will not get the same results as people who are serious about building wealth over time. In practice, SEO works pretty much the same way and the effects are very similar to a 401K plan. It is also important to understand that time is a key factor. If your web site is young and/or has a limited portfolio (content), then it will have only a few rankings. You have to invest in content regularly and optimize your pages consistently. The more content you invest in over time as well as optimizing your content accordingly, the greater your potential returns. It really is as simple as that. With SEO today, businesses need to embrace a business mindset of “content investment”. The reality is that in order to rank in Google’s organic search results, businesses need to become content investors. Why? Because Google ranks web pages based on content relevance and subject authority. With regard to organic search, Google wants the same thing it has always wanted — to display the most relevant contextual answer to the users search query as determined by the depth and quality of the content’s information. In many ways this is only common sense. In order for Google to be successful they have to provide a quality experience for their search users, so in order for Google to be deemed the best search engine, they have to protect their reputation of giving somebody a quality answer for the search that they provided. The good news is that all businesses are content providers in some way or another because every business is a specialist in some area of expertise. The mindset here is a “content marketing” model not a “publishing” model per se because we are “promoting content” to establish trust and authority in the brand via the business’ website or blog and other related web properties. Simply put, SEM/SEO today revolves around authoring deep, quality content and a content marketing strategy. The primary issue with content marketing and SEO is that many businesses short-sightedly want to cost-justify this approach based on individual customer transactions. But cost-justifying this approach based on a purely transactional business mindset misses the value proposition of good content marketing and SEO long term. Content marketing is not only tactically important to SEO by helping a business build a deep and rich content website within its niche and thereby attracting potentially pre-qualified visitors, but it also enhances how the visitor perceives the business and thus the visitor’s ultimate relationship with the business brand. How does content do this? It does this in a number of important ways. High-quality content predisposes visitors to the business’ message (brand) by over-delivering on what they came for – “usable information”. People use the Web as a searching tool. They search for credible high-value information or solutions, anything that can solve a problem, fulfill a need, or answer a question that they are experiencing. The primary task, well before making recommendations to a customer, is to provide the information (i.e., content) that people are searching for, in a way that customers find interesting and that search engines like. Visitors start to like and trust the business brand (based on what the business has written about on its site). Content marketing builds trust and credibility for the business brand. More importantly, focusing on the business target audience’s interests (and providing this high-quality “usable” content for free) will help position the business as a trusted authority within its niche. The visitor begins to like and respect the brand because the business is now perceived as a knowledgeable expert. The visitor develops an emotional connection to the brand because the content is informative and “usable” in context. Great content and proper content execution maximizes a business’ ROI because quality (usable) content creates an “open-to-act” or “open-to-buy” mindset. Consistently creating compelling content gives people a reason to return to the website and gives a business multiple opportunities to potentially sell to them. Selling online means taking every opportunity to bring potential customers closer to the brand in an engaged way. Quality content can do this better than any banner ad or sales collateral ever will. Content marketing creates online assets with long-term value. Compelling content spreads and creates multiple touch-points which will help lead people back to the business’ website. Good quality content builds customer affinity. Accordingly, high-value content is one of the core factors behind targeted traffic volume; the ability to increase and sustain it; and, most importantly, a key tactic for converting visitors into customers. For small businesses, this means adopting a business mindset of “content investment” by essentially providing above and beyond the normal level of ‘usable content” within its business market niche. As such, content marketing is more than just a search acquisition strategy. It really is a customer acquisition strategy for your business. Now that we have talked about why organic search, SEO, and content marketing are so important to any web marketing endeavor, the question is how can this process be cost-effectively implemented? What does a content-marketing strategy look like and what can I realistically expect in terms of ROI? In other words, what does this mean in practical economic terms? At VONT, we have developed a content marketing business model that helps any small business build an authority site within its specific industry or market niche.The process is easy to understand, simple to implement, consistent and repeatable, creates content value as an intellectual (company) asset, and is designed to align SEO objectives with what is best for long term results in ranking content in organic search. Instead of chasing SEO short term algorithmically-based tactics, the model is designed to amplify and align goals with Google’s stated SEO organic indexing and business objectives. To be successful in organic search today, you need to think of your website as a content (branding) engine with a core theme that’s relevant for its market niche, tone and business identity. More specifically, we like to visualize a website as a sort of content puzzle. Every (content) puzzle piece needs to fit within the website’s general content theme and tone. In this way, the more content pieces we add (the more pages we optimize), the more likely the website will become relevant for its topic in organic search. More importantly, one key aspect of this approach is that it radically changes the current emphasis in SEO from an obsession with keyword-specific rankings to a model that emphasizes audience building and “self-qualified” traffic – a much more valuable measurement for website performance over time. What are the principle tenets of this content marketing strategy? Capture targeted visitors to your website by using the concept of “Reverse Advertising” via organic search & SEO. “Organic Reverse Advertising” uses keyword search data to identify what customers are searching for and then uses that information to develop and deliver relevant content that appears for those key searches. It is “reverse advertising” because the customer proactively seeks you out rather than being “pulled in” by traditional advertising messages. Your content connects with “self-qualified” customers who are looking for information at the precise moment they are focused on that information, product and/or service. This ensures brand awareness by having increased visibility in a critical moment in the information search cycle when your competition could have dominated. How does organic reverse advertising work? The first step is to determine the search queries that fit the business goals/needs and are conducted by the business’ target audience in meaningful numbers. Next, we create content that not only ranks well for those queries but provides a user experience that helps searchers complete their task/goal and engages them more deeply with the business brand. Finally, we incorporate a “Call to Action” within the content that compels the searcher deeper into a conversion/action funnel. If you get the keywords “right” on your page and if you have great content, you will have substantial, ever-growing and highly relevant traffic. So how do we drive qualified web traffic to client’s sites and increase website visibility and performance in the search engine results pages via organic reverse advertising? We author keyword-focused content pages (KFCPs) of 600-1000 words around a subject theme comprised of 3-6 related keyword targets and then add the content to either existing topically relevant web pages that have weak content depth or as entirely new web pages depending on the website’s information architecture. We pick the main keyword that we are targeting and use it as the main headline as well as put it in the title of the page. Then we select a few of the secondary keywords that are semantic variations (called “long tail” versions) of our primary keyword, and write the page content to incorporate a few of these long tail terms. This approach allows us to optimize the web page for less popular keywords that are not as highly targeted by competitors. We create a keyword-specific page URL (where appropriate) for each keyword page theme as well as do the appropriate on-page SEO for each page. This creates a keyword pyramid for each page with the more generic (competitive) keyword phrase at the apex. The apex of the pyramid represents the primary target keyword and the base drills down to long tail keyword variations of the page content theme which in turn creates a sort of keyword magnet for the site and can be very effective in driving highly relevant traffic and thus organic visibility. With KFCPs, the goal is to write content that incorporates a themed keyword set that ranges in value from high to low demand and from low to high commercial value. 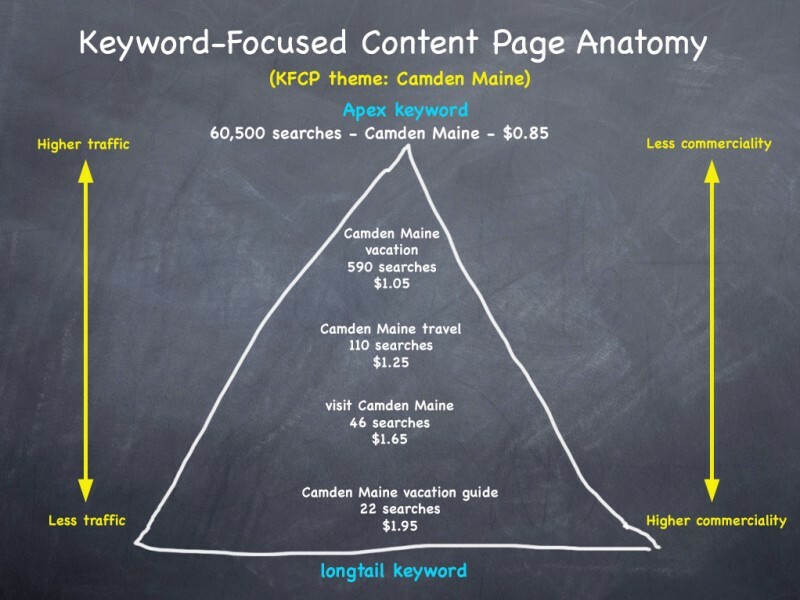 In this KFCP, the primary target (apex) keyword, “Camden Maine”, is generally more informational (educational) in context with higher traffic but less commercial value; and the secondary target keywords are more narrow in scope with less traffic but with higher commercial value (example: “visit Camden Maine”) because the inherent phrasing of the long tail keywords indicate the predisposition of the searcher’s “intent” and thus the potential for greater customer conversion (ROI). By creating a KFCP of 600-1000 words around such a subject theme comprised of 3-6 related keyword targets, you essentially create a keyword magnet and/or keyword net for organic rankings and better customer conversion. The net effect is that the KFCP strategy allows the web page to compete for a wider set of keyword terms that have both commercial and qualified traffic. Instead of focusing on just one specific keyword phrase, the KFCP is authored around a tightly focused subject theme comprised of several related keyword targets that also incorporate other semantic keyword variations based on that topic. Less emphasis on organic rankings since traffic is generated to the site from a wider net of tightly aligned keywords as well as many more pages of highly focused content. It allows you to capture incremental high value traffic through easier long tail keyword searches because these terms are less competitive. It also allows you to rank the content for the less competitive/high value terms so you appear on page 1 faster and then gain authority over time to subsequently rank for the more competitive terms at the top of the set. By authoring lots of KFCPs based on specific content topics over time (maybe 2-3 website article pages per month), a business can capture customers who are searching for information relevant to their business (niche) based on qualified keyword searches. KFCPs enhance the ranking and authority of the business’ website by increasing the overall page count – the more pages, the more links, the more traffic, the more authority within its niche. The bottom line here is that you have to show Google that your website is relevant to your subject niche. Accordingly, there are several things that you must keep in mind in order to successfully compete for a specific niche or subject theme using this content strategy. A single KFCP should be as closely related to a single aspect of the keyword topic as possible. The more targeted your page is to that aspect, the more likely it is that it will be chosen for the organic results. The goal is to stay focused and on topic. Within that topic, you can use different keyword variations that describe the same keyword theme. Since Google looks at semantic variations, you can have a diverse set of related keyword phrases that Google correlates as part of the same core keyword set. For example, the keyword phrase, “visit Camden Maine” is not actually used on the referenced content page even though it was originally targeted as part of the keyword set. Google knows, however, that this keyword phrase is semantically related to the content topic and thus has correlated it as being relevant for that content piece. In this way it is possible to rank for a diverse set of keyword phrases so long as the keyword variations are ultimately relevant to that same content topic. KFCPs allow Google to offer web searchers the best information/solution to their query/problem. See http://camdenmainevacation.com as an example for the subject theme, “Camden Maine”. To make your business web site relevant to a topic, it helps if you have multiple KFCPs that deal with different aspects of the topic. For example, one page on your site could be about the “history of Camden Maine”, other pages could be about “things to do in Camden Maine”, “top attractions in Camden Maine”, “lodging in Camden Maine”, etc. Thus, it is not enough that a web page is relevant to a keyword theme – It should also be relevant to the website topic. Optimize your web pages for these keywords and topics. The more pages you optimize, the more likely it is that your website will become relevant for its topic. The right keywords are very important but it is also important that you use them correctly on your web pages. The primary goal of KFCPs is to get higher rankings for many of these long tail keywords that in turn help the main website become relevant to a topic and trusted as an authority within its niche. The more high rankings the website has for keywords that are relevant to a topic, the easier it gets to get higher rankings for the more competitive keywords at the top (apex). Additionally, it is a proven tactic that people who search on long tail keywords are usually people who really care about the subject. These people are more likely to buy something and they might also link/share the web page/site. Create targeted and focused web pages (KFCPs) and optimize as many pages as possible on your website. The more highly relevant web pages your website has, the more likely it is that your website will get high organic rankings on Google. Finally, the most important consideration in content marketing is not only the most obvious one but also the most misunderstood in its application. The primary goal of KFCPs is to create content that is “inherently readable” and “interesting” for your audience. Everything else is secondary. Translation: Google wants to rank good content regardless of SEO optimization. This means that you need to invest time in writing KFCPs that are informative, “intrinsically usable” and written for your customers first – not for SEO or sales purposes. What typically matters to the user experience is an immersion in comprehensive treatment of a topic, as opposed to a linear sequence of short, article summaries via marketing and/or SEO prose on a specific service or product. Indeed, for many business-to-business (B2B) sites with long sales cycles, quick hits to commodity-level content are insufficient. Instead, these sites need to build up long-term customer relationships based on respect – typically through “usable content” of some sort. It is important to understand that for “usable” content, the distinctions are: in-depth vs. superficial; original/primary vs. derivative/secondary; and content driven by the business/author’s expertise vs. being driven by marketing or SEO objectives. This is especially important because the more value you add to your website, the more your customers will love you back. The more valuable you make the customer experience online, the more brand affinity you gain in return. “Usable” content creates authority and respect within your niche as well as creating publicity because it is more likely to get shared over time. Creating content that your users find useful, and people engage with, sends powerful signals to the search engines, thus helping your search engine optimization efforts significantly. The #1 rule of content marketing is simple: it is not about SEO and your keywords – it is about people and quality information! What is it worth to me (my business)? At this point, it should be obvious that content marketing is the de facto standard in SEO. From Google’s perspective this makes perfect sense since it coincides with their goal to deliver relevant content in the search results. Google gains because they are now showing more pertinent results for search queries and thus cleaning up their search engine results pages (SERPs). Customers gain because they get high quality content results with greater potential for answering their questions and/or queries. It also likely pushes businesses to use PPC more often since it is a guaranteed way to show up for competitive keywords in a timely fashion. (Some argue that this is exactly why Google is cracking down on SEO tactics such as subscription blog networks and contextual link building because they want to raise the bar for ranking competitive terms for everybody so that they can generate more income from PPC since content marketing amounts to a lot of work and increased costs for businesses.) Why not just use PPC instead? Convenient, right? In many ways, Google is enforcing the rules of the existing game by requiring strict adherence to content quality because they know this is an inherently more expensive business proposition. They want to separate the wheat from the chaff by subsequently raising the cost of entry into organic search for everybody so that businesses spend time, resources, and intellectual capital creating good quality content. This weeds out affiliate marketers and other online entrepreneurs because it makes it difficult to rank “thin content” which sole purpose is to trick visitors into clicking Google Adsense ads and affiliate banners. Is content marketing worth the ROI? So the question remains – is content marketing worth the return-on-investment for small businesses? Is there a way we can determine the relative value of a KFCP in terms of organic traffic and audience? If so, how? As it turns out there is a way to measure the comparative monetary value of a KFCP, thanks to Google’s PPC business model. The key is identifying those keyword search terms that are conducted by the business’ target audience in meaningful numbers and that also comprise the related keyword targets of the KFCP subject theme. Because the KFCP only targets keywords that have search traffic, these keywords have a corresponding commercial value in Google’s PPC model as well. Under Google’s PPC advertising model, Adwords, each target keyword has a corresponding bid value. This is the value a business is willing to pay for a click (visit) to a designated landing page based on this referring term. Let’s look at an actual example of how this works in terms of attributing value to a KFCP and ROI. Here is an 800-word KFCP on the subject “oil change” for VIP Auto. The original target keyword set includes the following 5 keyword terms with their respective PPC values: oil change ($3.32), oil and filter change ($1.86), car oil change ($3.40), auto oil change ($2.70) and oil change service ($3.18). The important thing to remember is that unlike a PPC campaign where we are bidding on (discrete) individual keyword phrases each with its own unique PPC value, organic search involves indexing a content piece based on its subject matter and the associated semantic keyword variations that are ultimately relevant to that same content topic. This means that there are many possible keyword variations that will likely drive visits to that KFCP creating a diverse set of related keyword phrases that Google correlates as being relevant for that content piece. In this context, it is not important that the 5 original keyword terms themselves rank in organic search results in order to drive traffic to the KFCP. They will likely rank eventually but the reality is that there are many diverse long tail keyword variations of the primary keyword set that can drive traffic to this KFCP. This is why the more rankings the website has for keywords that are relevant to a topic, the easier it gets to get higher rankings for the more competitive keywords in the keyword theme. Getting organic rankings for these longer tail keywords helps float the organic rankings for all the diverse keywords that might be associated as relevant to that content topic. The point is that we need to place an average value based on the main keyword set to account for a diverse number of possible long tail keyword variations in organic search. By totaling the PPC values of the 5 original target keywords and dividing the result by the number of keywords in the target set, we create a relative measure of value that we simply call the “Keyword Set – Cost Per Click (KS-CPC) value”. For this example, the KS-CPC is $2.89 [($3.32 + $1.86 + $3.40 + $2.70 + $3.18 = $14.46)/(5) = $2.89]. We can now check the visits in organic search to this specific landing page in Google Analytics. Because we are checking organic landing page visits, we can fairly assume that the traffic to this page is a result of organic search queries and that the majority of the search terms contain some variant of the target keyword phrases. In this specific example, this single KFCP yielded 318 visits for its first six months in existence. Based on its KS-CPC value that is equivalent to $919 of PPC traffic (318 x $2.89). After a year, we could conservatively assume that the visits should double to this page to 636 visits. That would yield a relative value of $1838 in equivalent PPC traffic. Of course, that assumes that the search visibility would remain static over time. By authoring additional KFCPs that deal with different aspects of this content topic, a business can further increase visibility and web site performance, thus generating even more visits based on qualified keyword searches. For the first 18 months to 2 years we would expect visits to increase and then stabilize for this page. The bottom line is that if you get the keywords “right” on your page and if you have great content, you will have a substantial long term stream of highly relevant traffic. More importantly, the cost to create the KFCP is typically cost-justified within the first year. In this way, the KFCP acts like an annuity over time – continually generating a return in perpetuity. Generally, a well-written 1000-word KFCP costs between $800 to $1,000 to write and implement. The ROI for a KFCP is naturally situational-specific and depends on a host of factors including the market niche, the competitiveness of the core keyword terms, search demand, commercial intent, and comparative PPC bid values. A conservative view of an industry average for CPC is $1/click (http://www.hochmanconsultants.com/articles/je-hochman-benchmark.shtml). Using this standard metric, 800 to 1000 visitors would cost-justify a typical KFCP. KFCPs create intellectual business assets with long-term value. A well written KFCP has the potential to be shared and spread online, creating multiple touch-points which will help lead people back to the business’ website. KFCPs build customer affinity for the business brand and as such are an important vehicle for customer acquisition. and if delivered in this manner and supported with equal or better quality content throughout the site, this first impression will grow and you will literally capture the mindshare of your visitor and potentially cultivate them into a life long customer. In other words, the KFCP model is one of the single most cost-effective factors for customer acquisition. If you develop and publish great and “usable” content, it will lead to the click. Why? Because you will be seen more like a friend making a recommendation rather than a stranger making a sales pitch. And if you create a truly great content-rich website, you will actually become a trusted expert making an endorsement. Well written KFCPs build customer affinity and brand loyalty. Do not push your visitor to the click. Make him or her want to click. Instead of focusing on ranking results, you end up focusing on content because that content pre-qualifies your visitor based on their interest and motivation. Simply put, it makes all the difference when it comes to customer conversion and retention.